Wilson is an 8-month-old intact male mixed breed dog who was recently pulled from a local shelter by a rescue group. He presented for his intake exam to assess his overall health and administer all vaccines, and to start heartworm and flea/tick prevention. His overall health was found to be excellent, with the exception of his skin. 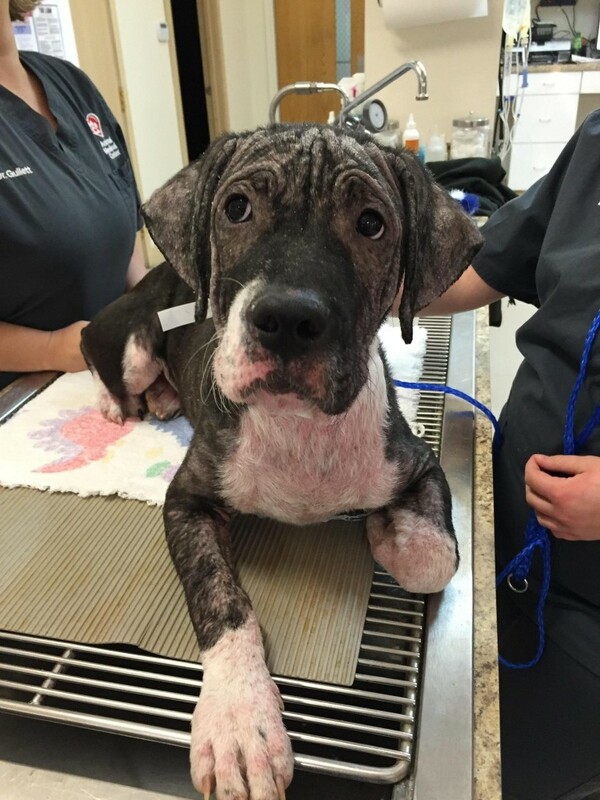 Wilson had numerous papules and pustules across his entire body, patchy hair loss, and irritation. After a skin scraping, it was determined that he had a mite called Demodex as well as a bacterial and fungal skin infection. He was treated with an antiparasitic for the mites, as well as an antibiotic and an antifungal for the secondary infection. After two weeks his skin had already shown marked improvement, and after six weeks you can hardly tell he ever had a problem! In fact, Wilson was recently neutered and is ready for his new home! Demodex is a mite that lives on all of our bodies, including humans. In most cases, a healthy immune system will keep it at low enough numbers that problems do not occur. However, when the mite population overgrows, it causes hair loss and secondary infection, as seen with Wilson. The most common time we see this is in puppies around the time of puberty, as the stress of growth and hormone changes sets up the perfect opportunity for those mites to grow! We will also occasionally see it in adult dogs as well. When this happens, there is concern for an underlying health condition, as the normal immune system should be able to maintain the mite population at appropriate levels. It is diagnosed with a simple test, and treatment is very successful in most cases. With appropriate care, this condition is easily treated and the pets can get back to living a long and happy life!